Tonight’s recipe is an easy and healthy meal that’s perfect for make ahead meals. Similar to the bags of frozen Birds Eye Voila Skillet Meals, where you just heat and serve. Only you control the ingredients and keep the preservatives out. Change up the cheese, meat, seasonings and pasta for lots of different flavor combinations. Chop chicken into small bite sized pieces. In a saucepan over medium, heat 1-2 Tbsp. olive oil, add garlic and chicken, saute until cooked through. Set aside to cool. 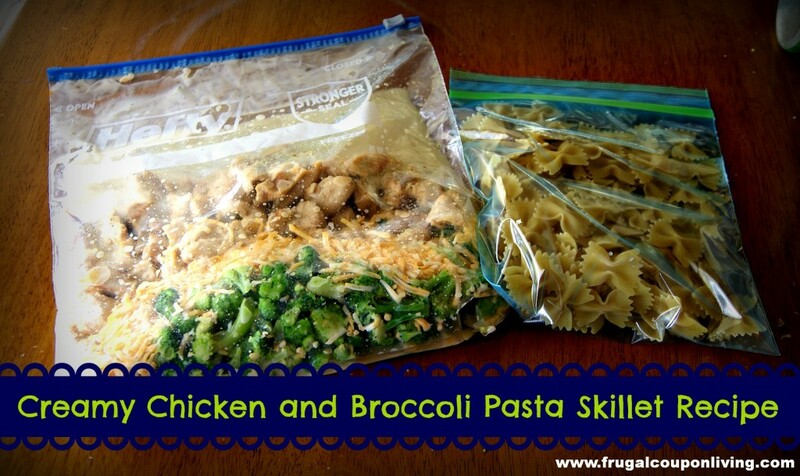 To prep for freezing, place; broccoli, chicken broth, milk, salt, pepper, and shredded cheese in a freezer safe gallon bag. Pour contents of gallon bag into sauce pan on low heat with 1-2 Tbsp. olive oil, cook until combined, Boil pasta for 8-12 minutes in 2 quarts of water. Toss pasta with chicken mixture. Serve.